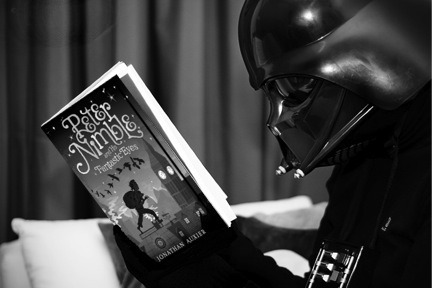 PETER NIMBLE is the utterly beguiling tale of a ten-year-old blind orphan who has been schooled in a life of thievery. One fateful afternoon, he steals a box from a mysterious traveling haberdasher—a box that contains three pairs of magical eyes. When he tries the first pair, he is instantly transported to a hidden island where he is presented with a special quest: to travel to the dangerous Vanished Kingdom and rescue a people in need. Along with his loyal sidekick—a knight who has been turned into an unfortunate combination of horse and cat—and the magic eyes, he embarks on an unforgettable, swashbuckling adventure to discover his true destiny. SOPHIE QUIRE The long-awaited followup to Peter Nimble! It’s been two years since Peter Nimble and Sir Tode rescued the kingdom of HazelPort. In that time, they have traveled far and wide in search of adventure. Now they have been summoned by Professor Cake for a new mission: To find a twelve-year-old bookmender named Sophie Quire. Sophie knows little beyond the four walls of her father’s bookshop, where she repairs old books and dreams of escaping the confines of her dull life. But when a strange boy and his talking cat/horse companion show up with a rare and mysterious book, she finds herself pulled into an adventure beyond anything she has ever read. Peter Nimble, the greatest thief who ever lived, is answering reader questions. Click here to learn more!